A NASA satellite tracking flooding after Hurricane Florence shows dark, polluted North Carolina rivers flowing into the Atlantic Ocean. The storm dumped 8 trillion gallons of water on the state, causing giant cesspools of manure from factory farms and toxic coal-ash pits to flood into streams and rivers. The pollution has now reached the ocean. “One image captured on Sept. 19 shows the New River, White Oak River and Adams Creek south of Cape Lookout and the deeply discolored water that appears dark brown — or even black,” the Charlotte Observer reports. 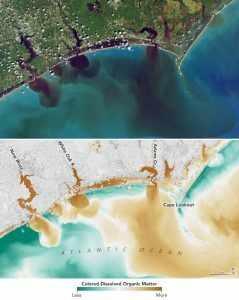 “The second image … reveals how soils, sediments, decaying leaves, pollution, and other debris have discolored the water in the swollen rivers, bays, estuaries, and the nearshore ocean,” the NASA press release said. “During hurricanes, storm surge brings contaminated coastal waters inland, which mixes with water from flooded livestock farms, septic tanks and sewage treatment plants,” says the video below. While I’m not doubting some of that is manure they just had hurricanes. So all dirt and loose debris settled everywhere, pretty sure a close up of the rivers will show trees, garbage and tons of stuff not supposed to be in there. So I SERIOUSLY doubting what we’re looking at is just manure. But it gets clicks like people like us. I agree it is more of the Globalist hysteria. Not true. There were only 3 lagoon breaches and only one of those was a full breach and even that liquid and manure didn’t get into a river, only the surrounding field. Quite a few lagoons were inundated, but the solids stay in the bottom and the liquid was diluted by 26-40 inches of rain. No doubt some liquid manure (a natural product, by the way) got into waterways. But millions more gallons of human waste from treatment plants and septic tanks got in than hog waste. And those farms are run by N.C. families; they aren’t factories. Dave, I’m not sure where u get ur data, but just reading what u wrote says it all. No he clearly stated 3 breaches. Wha about Japan nuclear plant fukoshima? As a rule those dairy farms have tanks or pits or ponds that they pump the manure out into. The manure is then pumped into manure spreaders which are taken out into their fields and spread it all over the fields which fertilize the spring time crops. It’s not their fault that they got hit by those hurricanes and tropical storms. Unfortunately these things happen. Another thing is those dairy companies as you call them are privately owned. The owners are the producers who sell their milk to the plants where they produce butter, ice cream, milk, cream, yogurt, cottage cheese, sour cream and a lot of others products you eat and enjoy everyday. Those that know the least about these dairies are the ones that sqawk the loudest. Get educated. Ignorance is not bliss.